This is an exploratory study to determine the patterns of highway accidents in North Carolina involving farm tractors and other farm equipment. 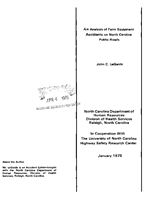 A total of 1806 farm equipment accidents occurring in 1966, 1968, 1969, 1970, and 1971 were used in this study (the 1967 accident files were not available), and certain comparisons were made using all North Carolina accidents in 1969. In addition, several other comparisons were made using the 1972 accident and driver license files. It was found that farm equipment operators in accidents suffer more fatalities and injuries than do other drivers. Farm equipment accidents follow a pattern of seasonal agricultural use and are more likely to occur in clear weather, during daylight hours, in open country, and on straight, level, paved roads. Farm equipment involved in highway accidents is more likely to be lacking proper lighting equipment than are other vehicles involved in farm equipment crashes. Farm equipment operators involved in accidents are almost exclusively male, while about three-fourths of all accident drivers are male, Above the age of sixteen, operators of farm equipment are older than are drivers of the other vehicles. Almost one-half of all collisions involving farm equipment and other motor vehicles occur when both vehicles are going straight, and another one-fourth occur when the tractor turns left while being passed by another vehicle. Adult tractor operators involved in collisions are more likely to be sober than accident drivers in general, but nearly 18 percent of adult tractor drivers involved in single-vehicle non-collision accidents have been drinking. On the basis of these results, the author makes several recommendations in the hope of preventing further accidents.